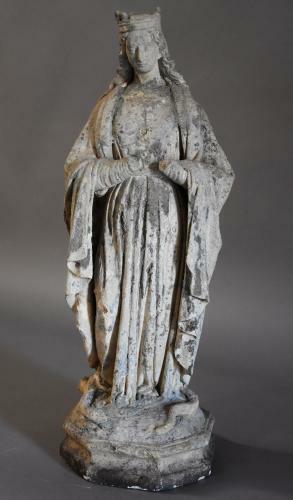 This sculpture depicts the Virgin Mary with a crown adorning her head, her long hair on her back, wearing draping robes, her arms in possibly a praying position although her hands are missing. The Virgin Mary has a snake at her feet which refers to the writings in the Book of Genesis of the crushing of the serpent, the figure is supported by an octagonal base. This sculpture is in very good condition for age apart from the missing hands and part erosion to crown.